Hidden deep under the lush hills of central Transylvania, Salina Turda is a place of magical beauty. The history of Salina Turda goes back two thousand years ago, when the Romans started to dig out the rich salt deposits of the area. 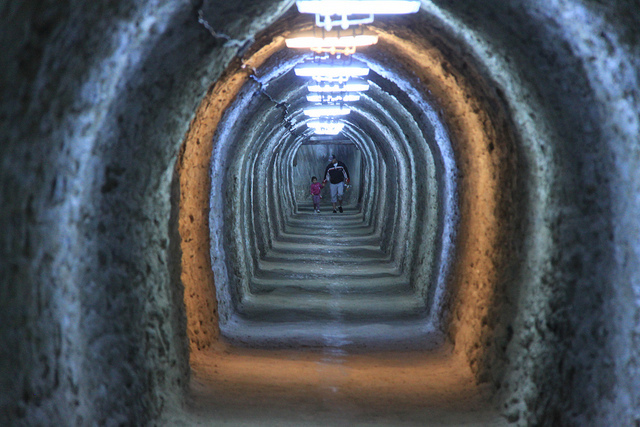 The gilded age of this fabulous salt mine, located just 30 kilometers from Cluj Napoca, began in the 17th century, when the Hapsburgs expanded the mineworks. By the 19th century, the 900-meter-long “Franz Josef” tunnel was built in order to simplify the transportation of the precious rock salt to the surface. 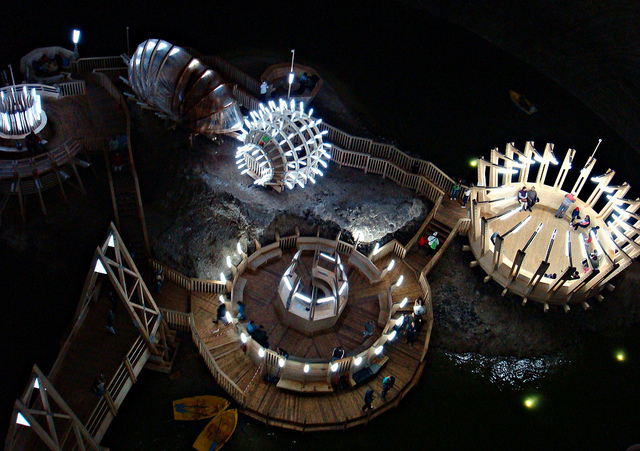 Salina Turda comprises four former salt mines, the oldest being the Terezia Mine, where salt extraction started all the way back in the 17th century. The other three are the Josef Mine, the Gizela Mine and the Rudolf Mine. In 1932, the salt mine was closed down, before reopening in 1990 as a touristic objective. The fame of the place started to spread around the world, so the number of visitors increased every year. A place of imposing beauty, Salina Turda is also renowned for its curative properties. People who suffer of respiratory problems come here to seek relief and therapy. The ionized air, combined with the natural humidity and pressure of the mine, act as a natural antidote to various diseases. To take advantage of these amazing natural curative properties, a medical center was established inside the mine. Salina Turda boasts the largest salt museum in the world. Found in the so-called “Crivac Room”, the museum hosts a centuries-old machine made out of wood, that was used to lift the salt to the surface. This simple, but effective machine is the only one in Romania, and probably in the entire Europe, that was kept in its original location. Salina Turda occupied the first place In Business Insider’s Top 10 Coolest Underground Sights ranking. With a Ferris wheel, a lake that can be explored by boat, an amphitheater with heated chairs, a bowling alley, a mini-golf course, and tennis tables, this underground paradise looks like the set of a sci-fi movie. To reach this futuristic underground world, visitors need to travel 120 meters underground, by stairs or by using the panoramic elevator that offers dramatic views over the entire place. Salina Turda has two entrances. The main one is located in the Durgău-Salty Valley area, while the second one, called the Franz Josef Gallery, is in Turda. This second entrance is the oldest, being built while the salt mine was still in use. Some of its most interesting attractions are the Josef salt mine, a balcony cut in salt, the Altar, the Rich Men’s Stairway, the Call Hall, and the extraction well hall. The grandiose Josef Hall has a conical shape and does not communicate with the other rooms in the mine, so the echo here is very powerful. For this reason, tourists call it the “Echoes Room”. On the ceiling of the main room, visitors can admire beautiful salt stalactites, some of them reaching an impressive 3 meters in length. Even during hot summer days, temperatures only reach 12 degrees Celsius inside the mine, so visitors should dress appropriately. You can’t get a real taste of Transylvania without Salina Turda, so make sure to include this salty underground wonderland in your trip.